After over three years of using the bullet journal, I have learned a lot. I’ve learned about myself, my hopes, my passions, and my shortcomings. I owe a debt of gratitude to the bullet journal. But I’ve decided that it’s time to try something a little bit different. You see, I have been disconnected from a part of myself for nearly eight years now – my inner artist. I sometimes let my inner artist out to play when I’m setting up pages in my bullet journal. But most of the time, that artist is under wraps. And I’ve been meaning to address that disconnect for years, but somehow, it’s always managed to stay on the back burner. There’s always been something more important to focus on and there’s just never been enough time for something as frivolous as art. Well, I’ve decided to change all that. I’m going to take the lessons I’ve learned from the bullet journal and evolve it into a new challenge for myself called A Month in Color. 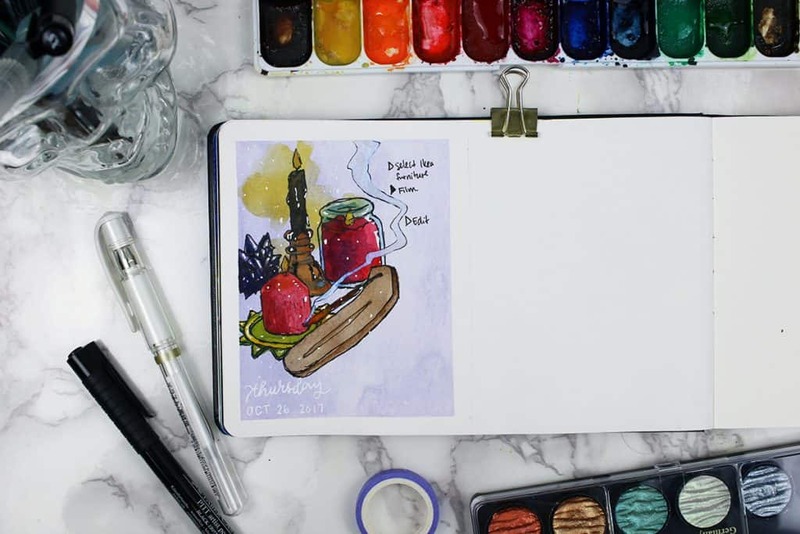 For the month of October, I am marrying my two passions of planning and art by starting my new watercolor planner. And I am going to do art in it every day. Yup. Every single day. And what’s even better? I’m taking you along for each step of the journey. Every day in October, I plan on putting out a brand new video on my Youtube channel showing you what I’m doing and my thoughts about the process. I want to show you every mistake, every accident, every victory… everything. You get a front row seat, my friend. I gotta say, I’m nervous. This is something I’ve shied away from for years and years, and I’m terrified that I’ll stink. I’m worried that all the pages will be terrible and you’ll hate it and I’ll feel like a failure. But deep down, I know that I need this. Just like I need to plan and organize and manage my time, I need to create and build and grow my passions. And as scary as it is to face down this hidden part of my life, I know that having a spotlight on my progress and sharing this with you is exactly what I need to do. And if I miss a day or have a bad art day? Oh well! I will plow on and continue to move the only direction there is – forward. So that’s pretty much the whole challenge. 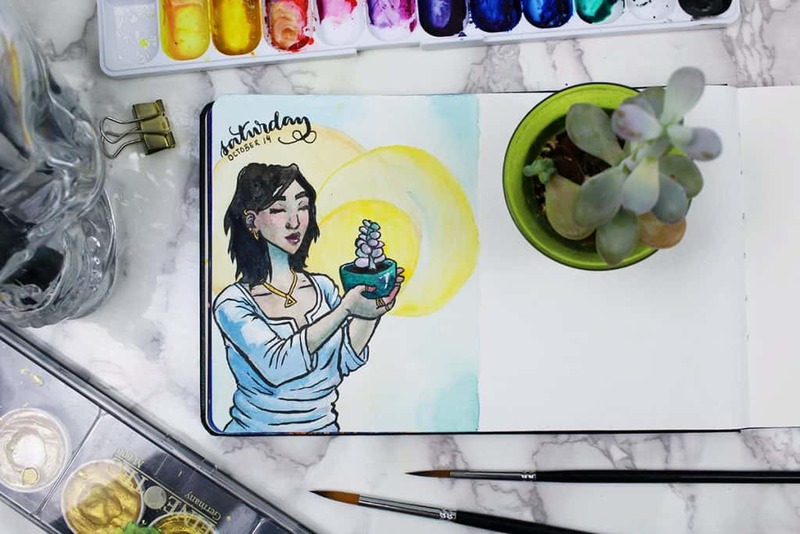 I do art every day on top of my plans (or plan on top of my art – both are technically true), film the process, and share it with you daily in this post and on my Youtube channel. At the end of October, I will have better creative habits, more understanding of watercolors, and a better attitude about my passion for art. Because honestly, what’s the point of organizing your life and having better time management if you aren’t going to do what you love? A Month in Color is going to produce loads and loads of content. Like, a serious gigantic amount. 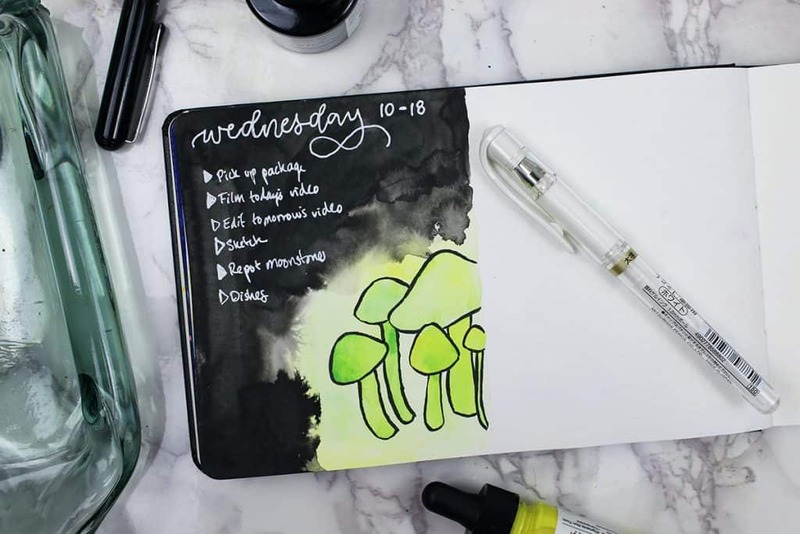 So don’t forget to subscribe to my Youtube by clicking here, and make sure to check back every day for brand new videos of my watercolor planner. While you’re at it, don’t forget to catch me on my other pages and platforms! 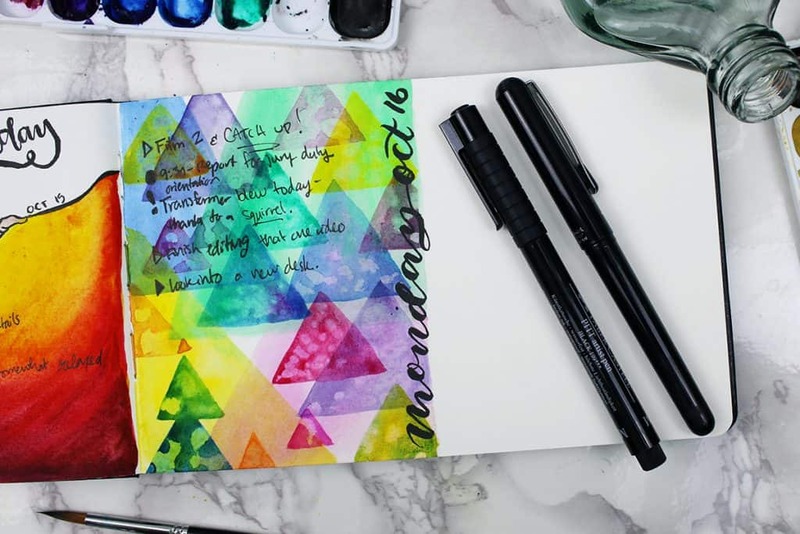 I’m sure that this list will expand as I play with materials and try new things during A Month in Color, but let me share the basic materials that I’ll be using for my watercolor planner. Yes, we’re finally here! 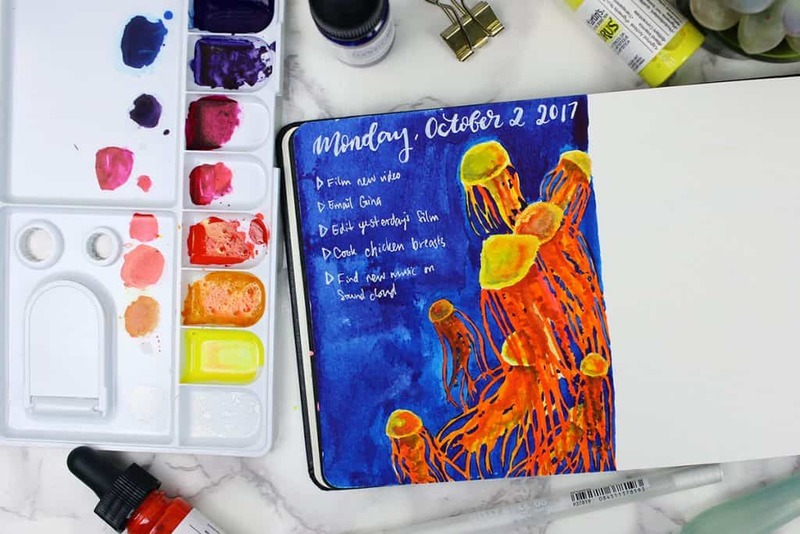 The first video of A Month in Color is simply a welcome page to kick off my watercolor planner. 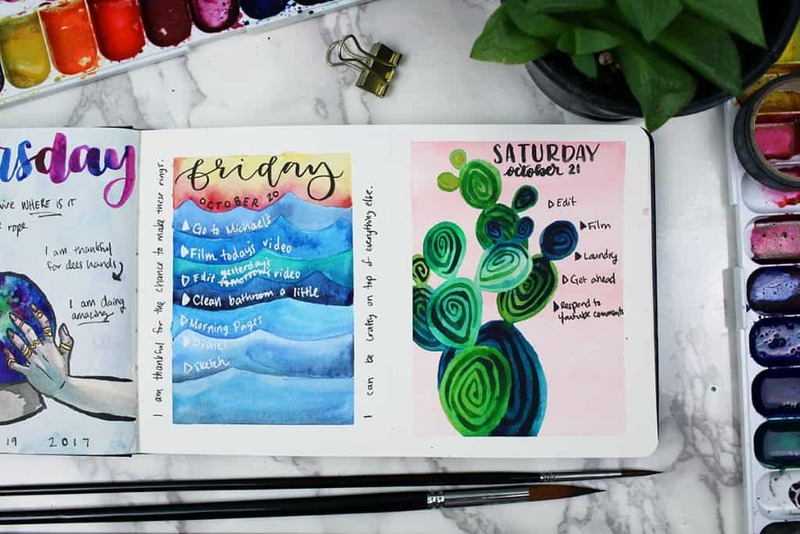 I had a lot of fun playing with these colors and patterns, and I think it does a wonderful job of setting the tone for how I want this planner to feel. I mention in the video that Minnie Small is a huge inspiration for me, so you should go check out her channel! At any rate, I feel exceptionally grand as I take the first bold step in my new watercolor planner. I can’t wait to turn the page. 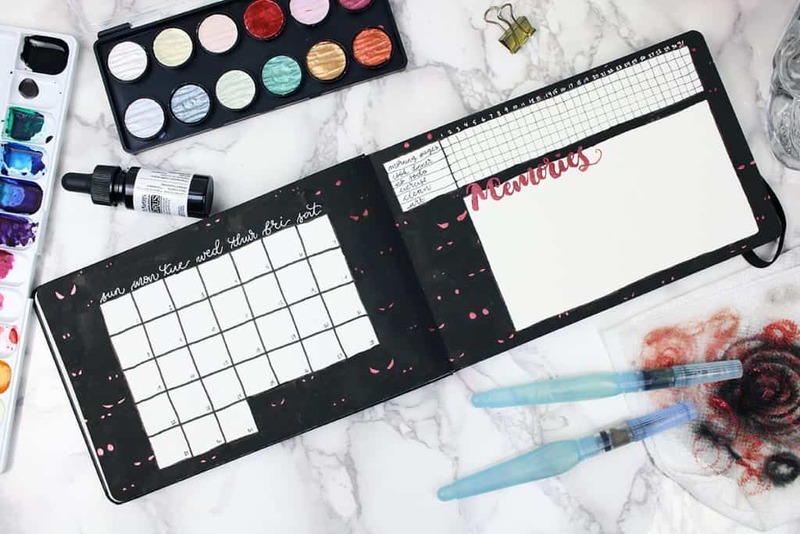 What better way to start planning than to set up a future planner? I wanted a simple place to jot down any notes for the future so I wouldn’t lose them. I created six columns and added a bit of flair with the layers and layers of color. 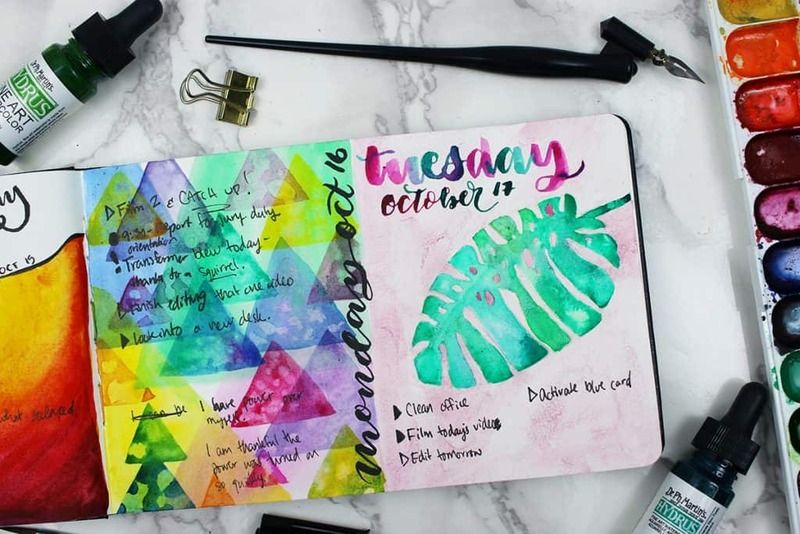 Setting up a future planner doesn’t have to be quite so extra colorful, but I might as well make it look good! After all, I will be looking at it for the next six months. 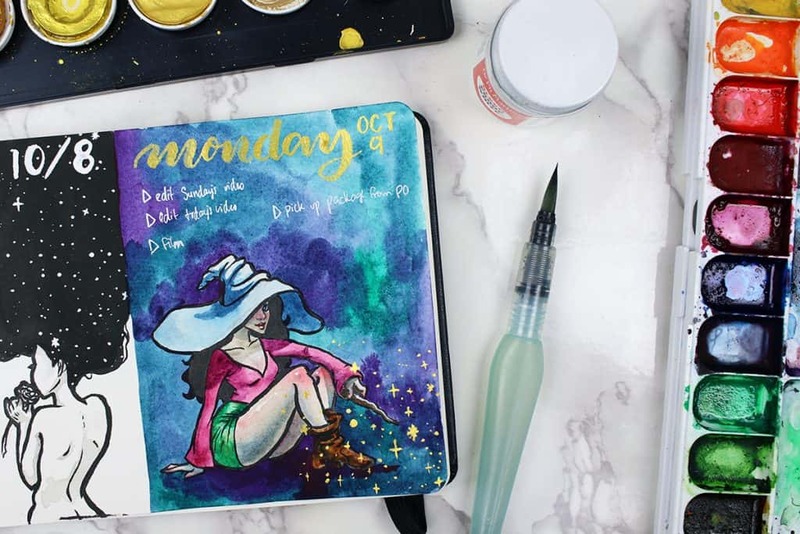 At long last, here is my October monthly planner! I don’t know about you, but I am totally lost without a monthly planner. I need somewhere to keep all my month’s appointments and schedules so I can see it in a glance. Plus, you know I love me some habit trackers. I decided to try and streamline all the data I collect. Before, I would have three or four spreads for a single monthly planner set up. Here, I’m only using this one spread. I also couldn’t resist a Halloween theme. But really, though – it’s my favorite holiday! I went with a simple design of glittering eyes in the dark. I thought it was a fun way to add a little mystery and horror to my monthly planner without splattering it in red paint (which I definitely considered). The pages did marvelously with the black paint, and there was zero noticeable warping. I think I’m in love. 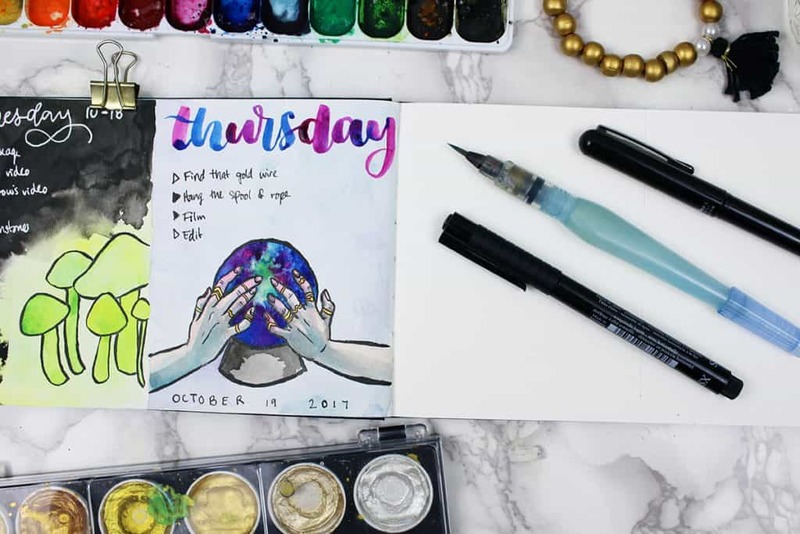 Today I jump into my first daily entry in my watercolor planner! I ended up starting on October second because I was pretty much only filming the monthly set up on the first, and that counted as daily art for me. I just didn’t really have anything to plan or note! So the second day of October it is. I knew I wanted to paint something with a vibrant yellow subject and a blue background, but I wasn’t sure on what to draw until moments before I started. That’s when it hit me to paint some watercolor jellyfish! I am so flipping happy with how this turned out. I mean, look at that color contrast! It’s just like what was floating around in my head. Painting between the tentacles… that was pretty tough, but not as impossible as I thought. It was an excellent exercise in loosening up as an artist. A few months ago, I managed to create a really incredible smoke effect with watercolors – and I haven’t been able to do it since! 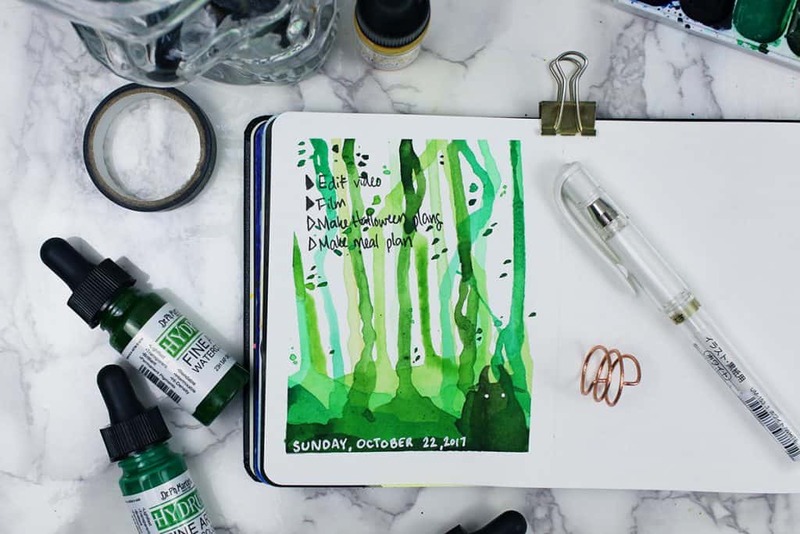 Today, I decided to take another crack at it in my watercolor planner. And it went… okay! I took about 30 minutes on this piece, building blue smoke layer after layer. This technique is all about patience, really. Patience and layers. I wasn’t really liking it for the first 20 minutes or so, but I kept working at it. Sure enough, this decent looking blue smoke took form. It may not have exactly turned out like I wanted in my head, but it was still an excellent exercise in building layers. I learned a little bit more about my materials, and that is definitely a success in my book. One thing I’d really like to explore during A Month in Color is anatomy. Specifically, I want to study and practice animal anatomy. It’s always something I have wanted to sit down and work on, but I never seem to get around to it. That is why today, I am focusing on the anatomy of this bird. Well, it’s not an anatomy study per se, but a study of how the feathers and whatnot all work together. I used a few references to sketch out the bird, but I did all the coloring and shading totally by trial and error. In the end, this little anatomy study went rather well! I’m pleased with my little birdie. I knew that I would soon run into this problem during A Month in Color. I had a day that left me exhausted and disappointed. Today was a lesson in how to deal with frustration. There was no lack of motivation or inspiration – I knew what I wanted this piece to be, and I had the drive to do it (at least at the beginning). But once I started, nothing was working. It was like my brain and my hand were disconnected. This happens to everyone at some point or another. And while it’s easy to want to drop everything and walk away, the true lesson lies on the other end of this struggle. You have to keep working at it, despite your frustration. When you continue to strive despite the frustration, you push yourself out of your comfort zone and encourage determination. And some of the best discoveries happen outside of your comfort zone! 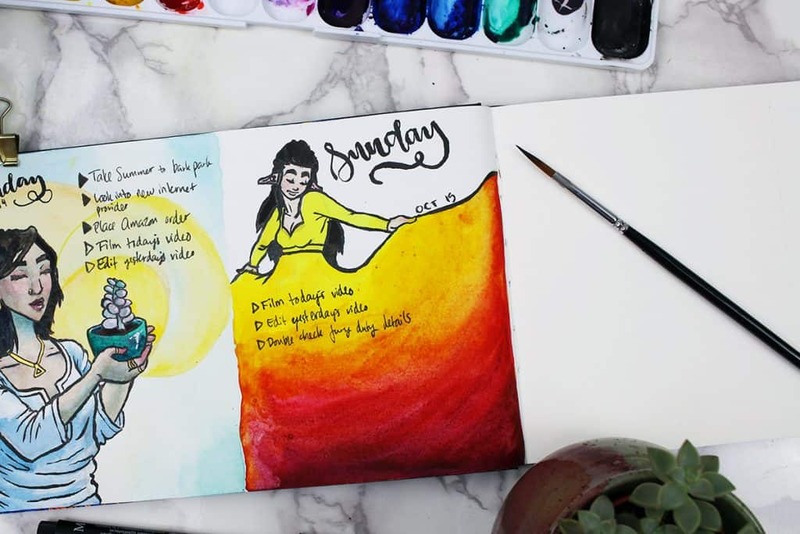 One question that I get asked again and again is, “How do I find time to be creative every day?” The answer is simple – you don’t find time, you make time. If you always wait around for the best time to sit down and draw, that time will rarely come. You need to instead make the time and put your art front and center in your life. Don’t shove it to the back of your schedule! 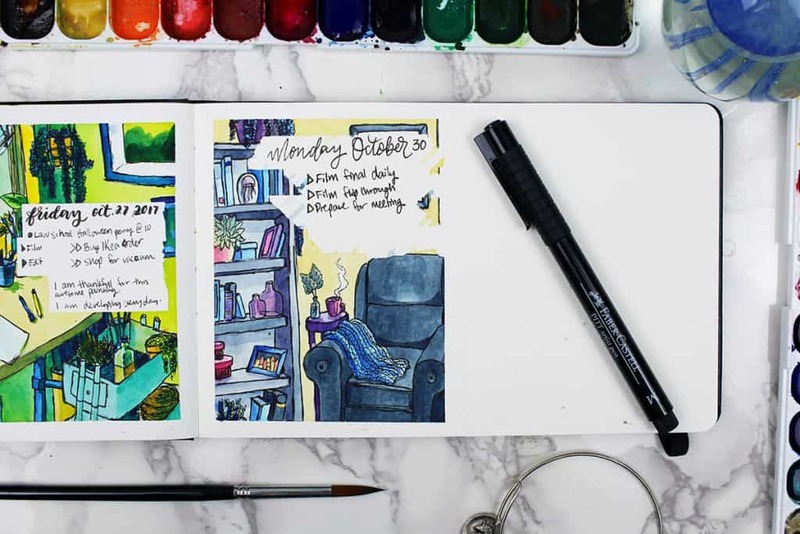 Instead, make drawing an immovable part of your day. The answer is simple, but it is certainly not a cake walk. Stepping away from your phone or TV or browser is tough because those things are designed to pull you in and keep you around. But if you want to take your art seriously, you need to break the spell and decide to make art a priority in your life. You need to be in charge of your schedule and decide what is flexible and what is firm. Watching another episode of your new favorite show can take a back seat to your art, because after all – which is more important, truly? This painting was a really quick and loose experimental piece. I used lots of different color choices than normal, and made the whole thing look quite dramatic, I think. Before I put down the lines, I thought it looked kinda sloppy. But once I added the lines and the highlights, I thought the whole thing came together super well! I also used no photos as references – instead, I used my own hand holding a bottle that I had lying around. This was definitely a great growth piece for me that challenged me and left me feeling like I’d done good work. After only ten days of A Month in Color, I’m impressed at the effect of drawing every day. In the last week or so, I’ve found that I’m sketching way more than I used to. And the ideas are really starting to flow, too! I have even started keeping a sketchbook next to my keyboard so I can jot down any random ideas that pop into my head. I knew that I would see some changes in my life after I started drawing every day, but I had no idea exactly how they would manifest. Needless to say, I’m extremely pleased with this regained desire to sketch. I used to sketch constantly back in high school when my art was at its peak. But in the last seven or eight years, I haven’t sketched much at all. This effect of drawing every day feels like an endangered animal returning to its natural habitat. Sketching is such an essential part of doing art, and it feels incredibly refreshing to see it come back into my life. As I push deeper into A Month in Color, I’m uncovering lots of deep seated anxieties around my art. One of them is entirely around art style, and the fact that I don’t really have one. When you look at successful artists, they almost always have a distinct art style that makes it easy to identify the artist right off the bat. And it’s easy to compare yourself to these successful artists, even when you’re just a beginner. But looking at the polished work of more experienced artists is enough to put you in a rut of anxiety. I get there, too – in fact, this is one of my bigger hang ups when it comes to art. I don’t know what my style is yet, and it freaks me out because it feels like I ought to have one now. Do I use line work? What will my main subject matter be? Do I have a distinct color palette? Will I work mainly in abstract art or portraits? And down the spiral we go. But of course, that’s not a good way to think about it. Dealing with art style anxiety means that you have to just put the pencil to paper. Who cares if this is leading to my signature style? The point isn’t to build a brand, it’s to ENJOY the process of making art. 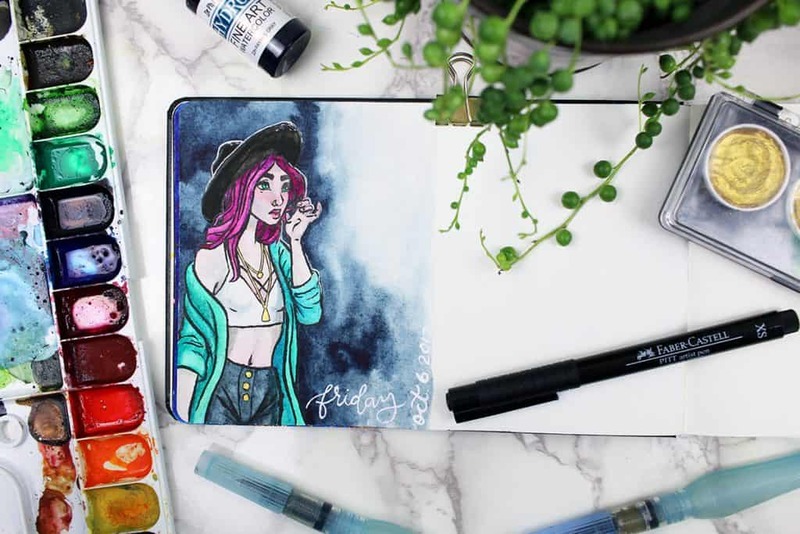 You need to simply draw or paint what you enjoy, and your art style will follow – with lots and lots of practice, of course. I’ve had several people ask me over the last few months to create a tutorial for painting watercolor galaxies, so I thought this was the perfect opportunity to do just that! 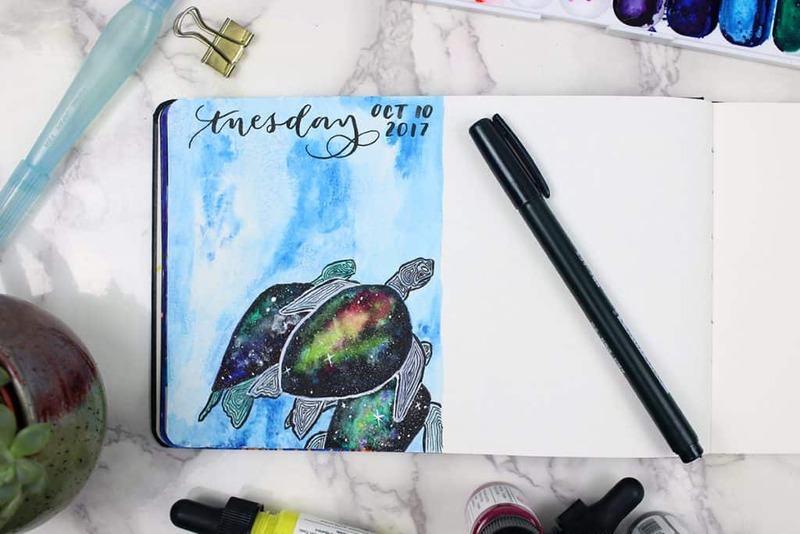 I had a ton of fun creating these galaxy sea turtles, and it turned out so excellent. I am definitely pleased! Watercolor galaxies look pretty tough, but they really are quite simple. It’s just working quickly and employing a wet-on-wet painting technique. 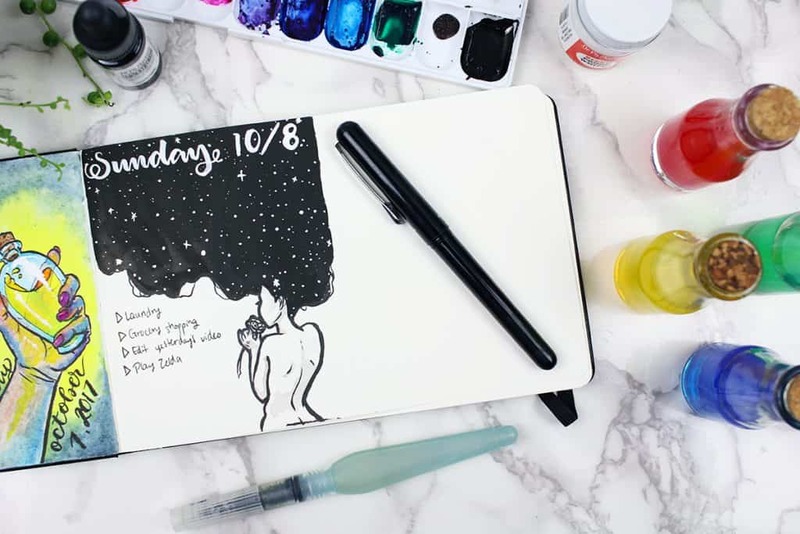 If you have watercolors, you can totally make yourself a gorgeous watercolor galaxy! When I’m stumped and I don’t know what to draw, I can always fall back on a mermaid. That’s what happened here! I just wasn’t feeling super inspired to create something ambitious, so I dusted off my old mermaid-drawin’ skills to create this pretty little watercolor mermaid. I really enjoyed how all the soft colors came together, and I especially enjoy the white highlight that I added on her tail and hair. And don’t even get me started on that golden smoke. I don’t have much to say about this one other than I like it! One of the many pieces of art-related baggage that I’ve accumulated over the last several years is the burden of art guilt. I constantly feel guilty at the prospect of buying new art supplies, no matter how small. 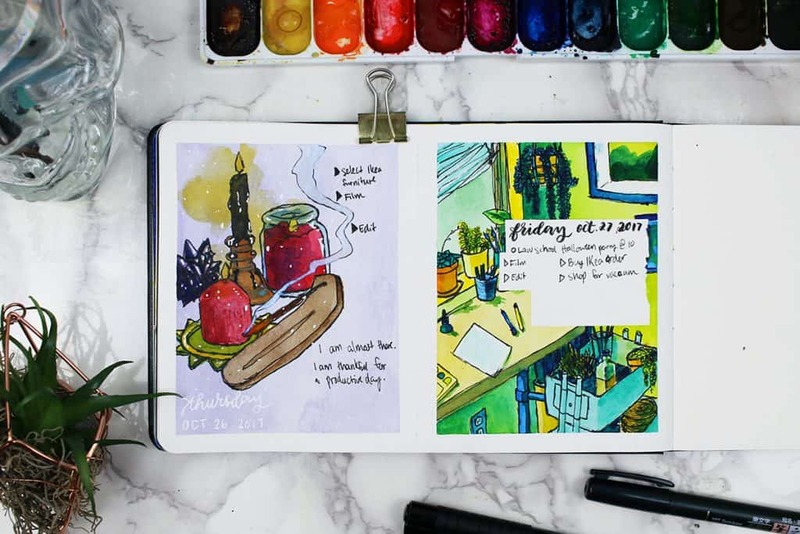 I was able to get around this a bit with my bullet journal because new bullet journal supplies led to me being more productive, but art doesn’t have that same claim. Art is fulfilling, but it doesn’t help me meet deadlines or pay the bills. So the prospect of spending my hard earned cash on art supplies wracked me with guilt. I’m happy to say that with this painting, I used my brand new paintbrushes that I finally bought after needing them for years. And while there is still more work to do in the hopes of overcoming art guilt, I feel like this has been a milestone worth celebrating. 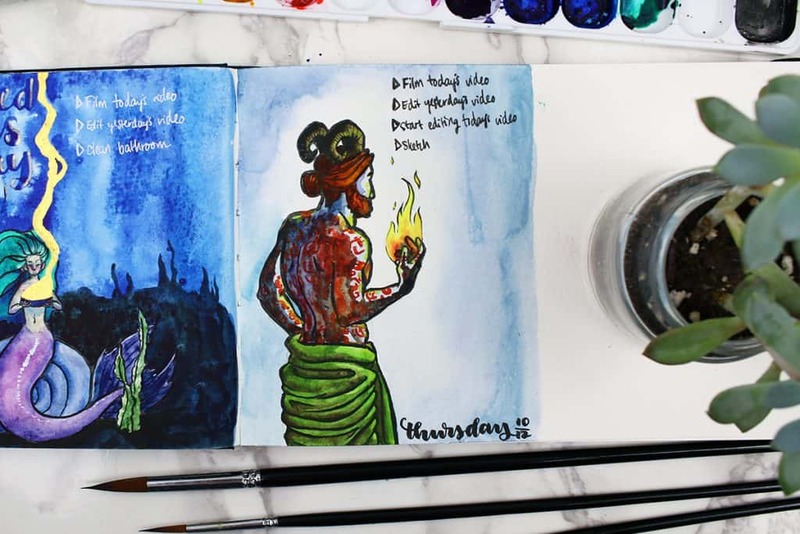 Plus I had a blast painting this fire god/demon/spirit and getting all intricate with the runes on his skin. All in all, today was an victory for art! Today was a short and fun drawing of a classic black hatted witch to celebrate Friday the thirteenth! I love the superstitions around this day, and I’m so stoked that it happened to occur in October this year. What a treat! I kept this video pretty simple because I have jury duty tomorrow and I’m trying to get ahead so I can still post. That being said, I hope you enjoy this whimsical witch! I have a confession to make. I love using the Finetec gold palette. It’s one of my favorite things. I have been using it for over a year now, and I can’t get enough of it. 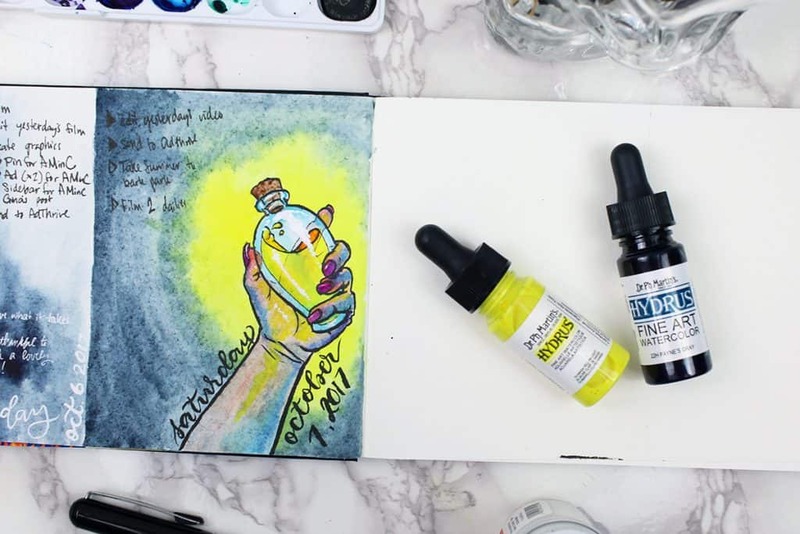 Not only is it incredible for brush lettering and card making, but it’s unstoppable with art. Seriously, just add a bit of metallic gold or silver to a piece for accents and BOOM. You’ve got yourself something that looks good, period. You can say I’m a bit obsessed. That might be, but I’m okay with it! I just wanted to dedicate this episode of A Month in Color to my love of using the Finetec gold palette. I’ve hit a wall, guys. It’s pretty unpleasant. I feel so uninspired and I find myself procrastinating every single productive thing I could possible do. Frustration doesn’t quite cover this sensation. This piece was incredibly annoying to make – I made so many mistakes, I thought it looked sloppy, and I even struggled to get my camera equipment to work with me while I made it. Ugh! I’m not feeling burnt out – that’s not what this is. It’s just an art slump that I need to throw my shoulder into and push past. I’m confident that I will break through any moment now, but it’s a struggle right now. Hopefully tomorrow is better! As I continue to work through this art slump, I have come to the realization that a large chunk of my problem comes from the fact that I have commitment issues. I enjoy the excitement of a new relationship with a hobby or craft, but as soon as that excitement wears off, I’m very likely going to abandon it for something new. It’s a real issue that has led to a lot of guilt and shame because of my inability to hold down a hobby. And I’m talking all the hobbies I’ve done – sewing, leathercraft, jewelry making, etc. So I’m making a conscious effort to push past it this time. I’ve had an on and off relationship with art, so I know I will never fully abandon it, but I don’t want to be flaky this time. So I’m gonna commit this time! Today I did a little painting of a big monstera plant leaf. The reason this plant has been on my mind is because I’ve been thinking a lot about creating an inspiring workspace that helps me get in the creating mood. We recently moved to this apartment so I could have an office, and since then I’ve been dreaming of all the ways I could really make it a utopia of inspiration. That’s got me thinking about plants, decor, function, and style a LOT lately. 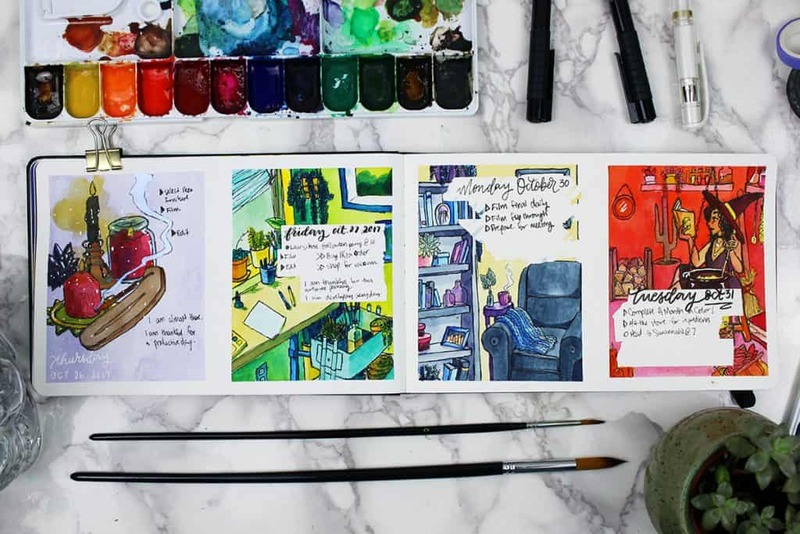 I just think it’s important for any creator to have a comfortable space that speaks to their style in a deep way, and I want to create that for myself. I recently bought a few new supplies, and one of those was Dr. Ph. Martin’s Bombay black ink. I thought I’d give it a try with today’s painting of glowing mushrooms. What I did not expect was the very strange way that ink behaves. There’s nothing wrong with the way ink acts on the paper, but boy I sure didn’t expect it. You’ll have to watch the video to see the weirdness in action, but suffice it to say, that was the last time I jump in with a new product without testing out first. Painting with ink for the first time was a very educational experience. Learning how to draw with no inspiration can be one of the most rewarding things an artist can learn. It’s something that I’m still in the process of learning, though I’ve come a long way. I used to wait around for inspiration to strike like a bolt of lightning, but that resulted in me making almost no new art in six years. So how on earth are you supposed to push past the inspiration barrier to make something worthwhile? The answer is that you simply need to work, whether inspiration shows up or not. In the video, I detail how I get into my work regardless of inspiration, and how it actually can result in some really lovely work. Today I wanted to play around with building layers to add depth, and I decided to throw some washi tape borders up on a whim. Boy, was that the right call. This tiny washi tape hack had an enormous impact on the final look of this piece. The uniformity of those crisp, clean lines just made my socks roll up and down. And it’s so easy to do! This isn’t any special washi tape – I just grabbed one that was lying around. I would totally recommend that you give this quick washi tape hack a try sometime to see how it adds a certain polish to your work. You will absolutely love it. I know I did! Today I decided to play around with shape and composition rather than color and shading. I went in without lines or any idea of how it would look ahead of time. I just knew that I wanted these fun prickly pear cacti shapes, and that I wanted to blend them into each other. And it went swimmingly! The whole thing was almost a meditation, really. I just put my paintbrush on the page and let the picture paint itself. I love it when the painting process becomes a discovery process! 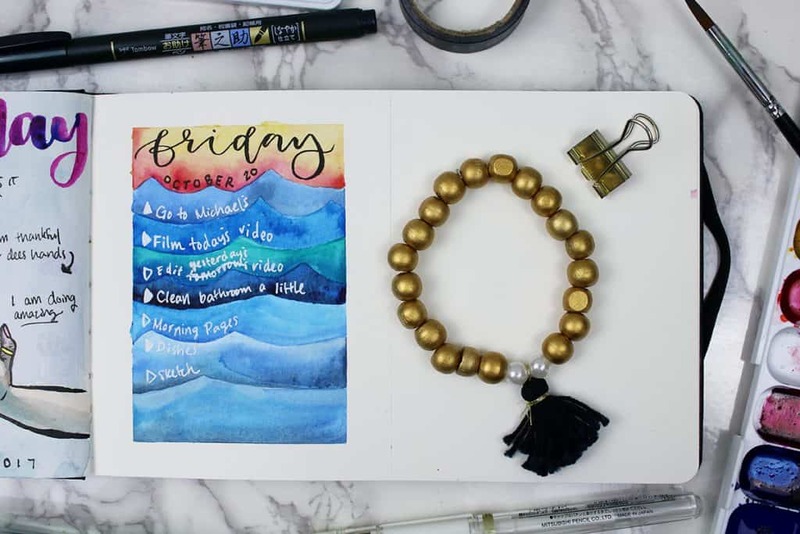 One of the more fun techniques you can create with watercolor is the drip effect. It’s one of those things that just looks so fun, spontaneous, and visually interesting no matter what you’re painting. 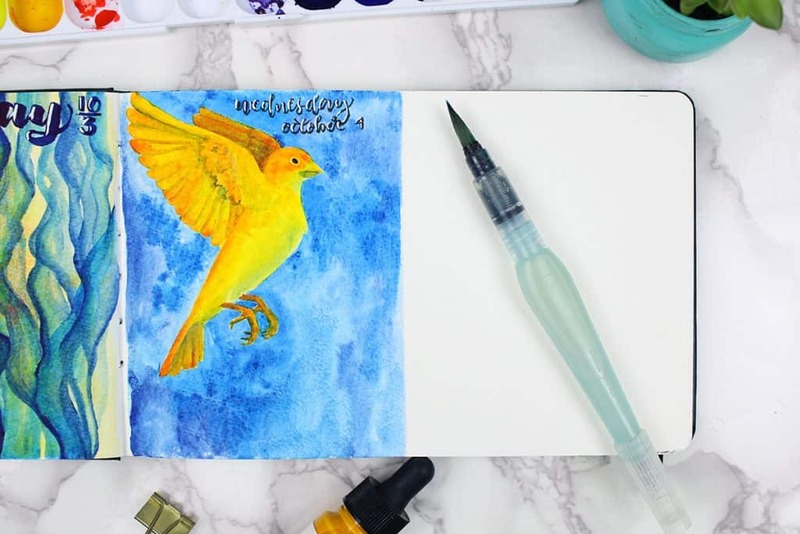 So today I thought I’d take the opportunity to give you a few tips on how to control your watercolor drip effect and get the best results! Of course, this isn’t a super in depth tutorial, but it is a perfect starting point for anyone who wants to give a try for the first time. Though I will admit that it’s not the best for writing over, so that’s something to keep in mind. Every day is a discovery! 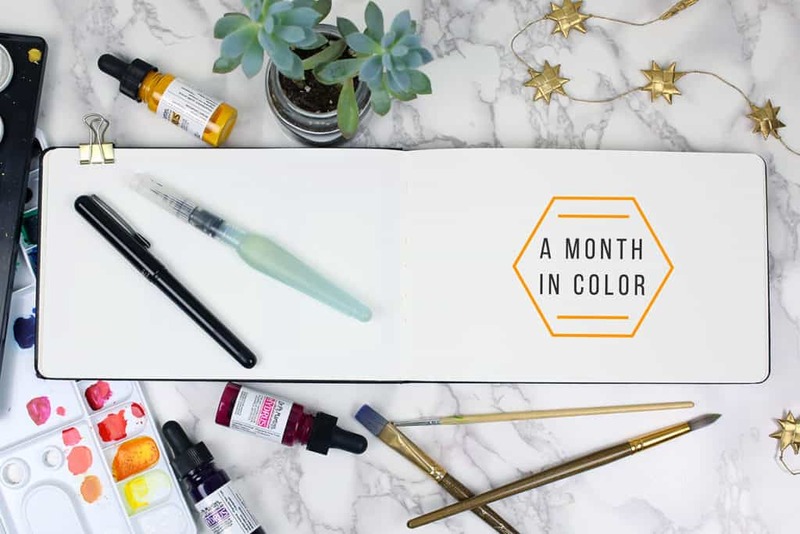 You might be following A Month in Color and thinking that you’d like to do something similar. That’s great! I love seeing other people get flushed with inspiration and set goals for themselves, especially in the creative realm. 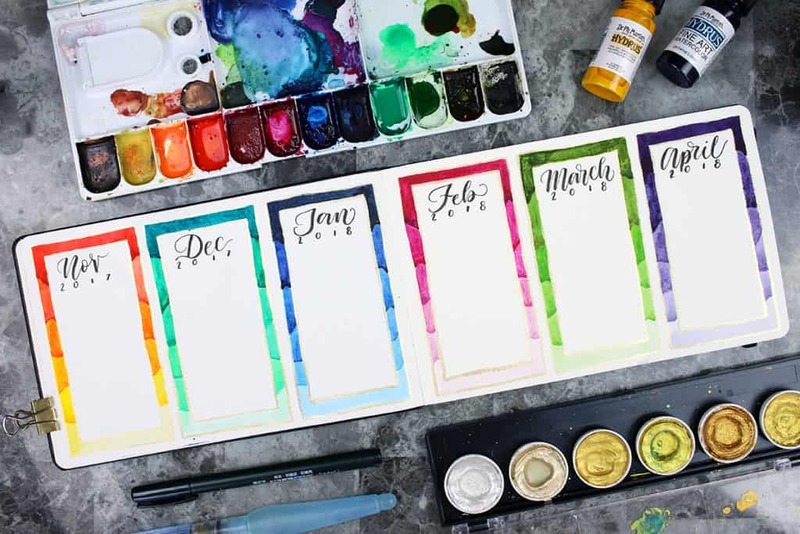 Since we are approaching the holidays and the new year, you might be tempted to set yourself to begin a watercolor planner on January 1st. But don’t make this your New Year’s resolution. The reason I say this is because if you are looking at this goal right now and thinking about it right now, then you should start right now. Waiting around for a certain tick in the calendar is only procrastinating. Besides, think of how much progress you can make between now and then! I’ve only been working on A Month in Color for three weeks and I’ve grown heaps since I began. My point is that there is no time like right now. You don’t have to get everything just perfect to prepare, you don’t need to be inspired, and you don’t need to wait until a resolution kicks in. You can do it right now and make amazing strides towards your goals. Basically, you got this. Today I decided to try my hand at creating a look entirely made up of flat washes. It was a tough one! Flat washes look simple, but they are deceptive. I spent a lot of time second-guess my choices and going back to change details, and I don’t feel like I captured the essence of my vision. However, I do feel alright about this piece. Even though it didn’t turn out to be the pinnacle of flat wash art in my life, I did learn a lot and it gave me some experience so I can improve. Not every day will result in incredible art, but every day can yield small lessons to slowly grow into a vast library of knowledge. So all in all, it was a victorious day! Today I hit the artistic jackpot with wild unexpected inspiration. It felt amazing. I decided to paint a sort of collective portrait of my houseplants (or most of them, at least), and in the process of this painting, I felt that creative electricity. I think it’s safe to say that my art slump has passed. I’d even go so far as to say that this is my favorite piece in the entire series of A Month in Color! I’m genuinely happy and I can’t wait to paint more and continue to push forward. Art slumps and creative ruts are temporary, remember that! The moral of the story here is that you can keep pushing and you should. You will be highly rewarded for your effort and faith in yourself. I’ve been doing a bit of meditating on yesterday’s success and I’ve come to realize that letting go of control was the key. Over the years, and over the course of A Month in Color, I’ve kept a firm grip of control over what I draw and paint. But yesterday, I had little expectations and that was enough room for inspiration to take root and really help me develop something different and exciting. So today, I decided to keep pulling on that thread to see what happens. I replicated the style that I loved so much yesterday, but with my subject matter being some lovely candles, crystals, and incense. I think there is a lot to learn down this path, and I am excited to be making progress and sharing it with you. In today’s video, I thought I’d share with you the tale of how I decided to go full time with the blog last year. It was a terrifying decision and it completely changed my life – for the better, I might add. There are obviously a lot of factors to consider when making such a big leap, but it came down to faith in my success. Because you’re never going to full totally ready. If I had waited until I was perfectly ready, I’d still be working a job I didn’t enjoy and making a lot less income. And I want to stress that I am not elite in any way. I am in no way the most talented or skilled blogger/artist/photographer/writer/vlogger. I simply tried, and tried again. The key to success in pursuing your passion isn’t talent, but dedication and a willingness to work hard against the powers of fear and doubt. If you can do that, then you are already miles ahead of everyone else. You’ll have to watch the video (you can click the image below to go to it) to get the rest of my thoughts on the subject, but my message is this: if you want to make it happen, you can make it happen. 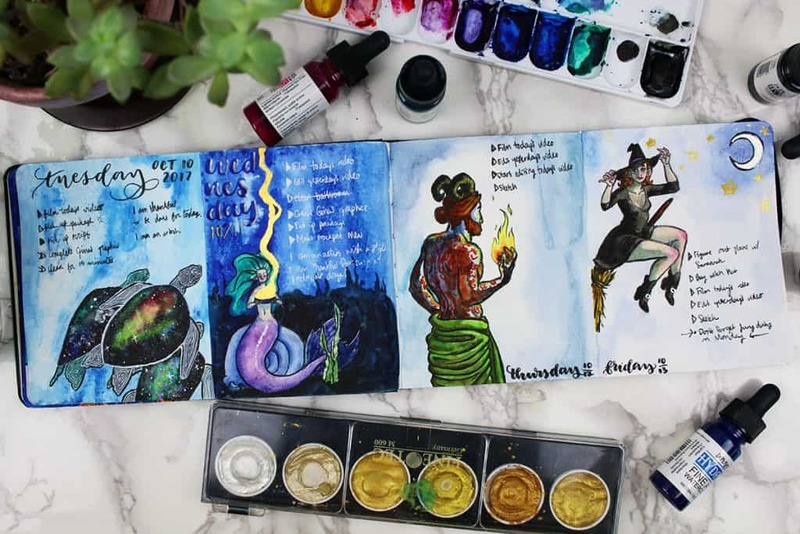 I thought it would be fun today to talk about how to find inspiration for your art. It’s something that is notoriously tough to pin down, because a lot of inspiration is sort of abstract. But there are a few things that I can point to, like my favorite artists on Youtube and Instagram, my every day environment, and some of the lovely details out in the world that often go unnoticed. I especially want to point out the importance of having a comfortable environment that makes you feel creative. Working from home means that I spend 99% of my time in my apartment, and that has really made me more attentive on upgrading the aesthetic of my office and home in general. The same goes for clothes and personal style, too! I’ve really noticed how I feel confident and more inspired when I’m wearing my favorite clothes or when I’m wearing some make up – even if I’m not leaving the house, it makes a big impact on my work. When it comes to finding inspiration, it all comes down to paying attention. Everyone is inspired by things in their lives, but often we can’t put words to it. But when you begin to stop and notice those feelings when you find yourself drawn to a certain texture, color, shape, etc… then you’re going to be able to identify those inspirational details and bring them into your life more. I can’t believe that today is the last day! I am both elated and saddened to say goodbye to A Month in Color. This has been quite the journey for me! I have learned a ton about my abilities, my weaknesses, and how to move forward with my art. That begs the question – where do I go from here? 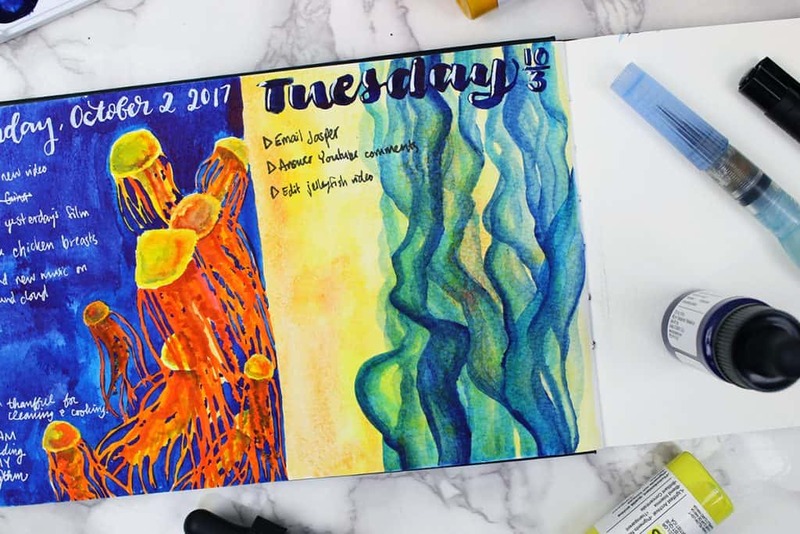 Do I continue one with my watercolor planner, or do I go back to the bullet journal? Honestly, I don’t know what the future holds for me. 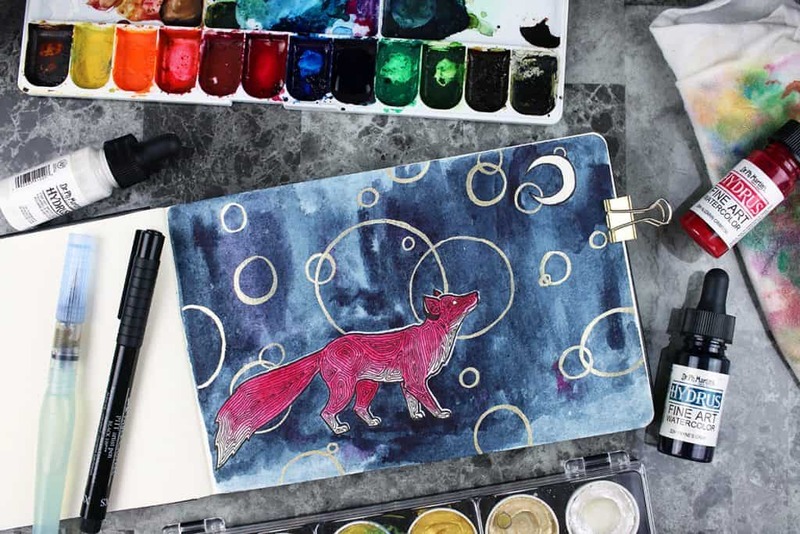 For now I plan on sticking with my watercolor planner, but that may change at any time. This is real-time self discovery, folks! For now, though, I just want to say thank you to all the wonderful people who supported me throughout this process. It was an exhausting, daunting experience, and I don’t know that I would have made it without your encouragement and positivity. You guys rock. I don’t know what lies ahead, but I am happy to put A Month in Color to bed and take my lessons with me into the future. Now we go onward and upward! What printable are you looking for, Eileen? Ce n’est plus un planner, c’est une oeuvre d’art. Bravo! je suis ébahie par votre talent. So glad your playing with Watercolour. I am 62, I have disabling M.E, never drawn or painted, except as a child. A year ago, i started and love every minute. Even the mistakes and dreaded cauliflowers. Embrace it all, .and paint. 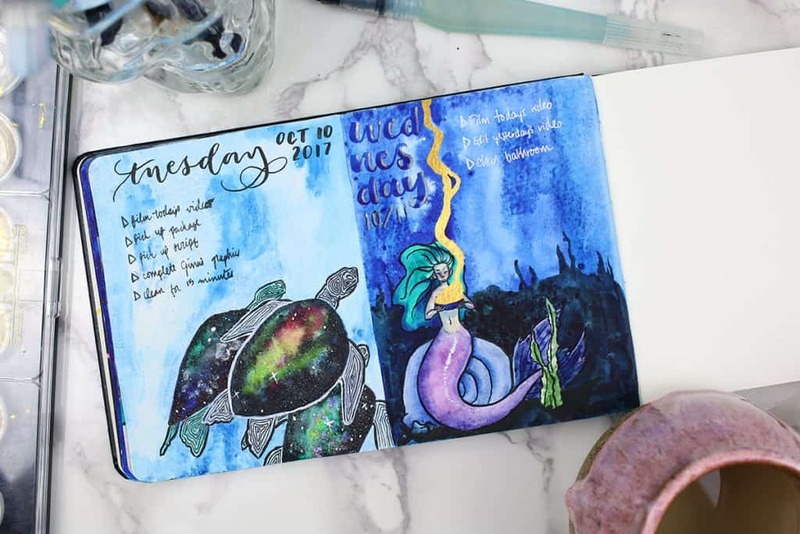 I started my first Bullet Journal in last year´s august after reading tons of articles on your blog – and I love it! I always enjoy coming back here for inspiration, so thanks for that! 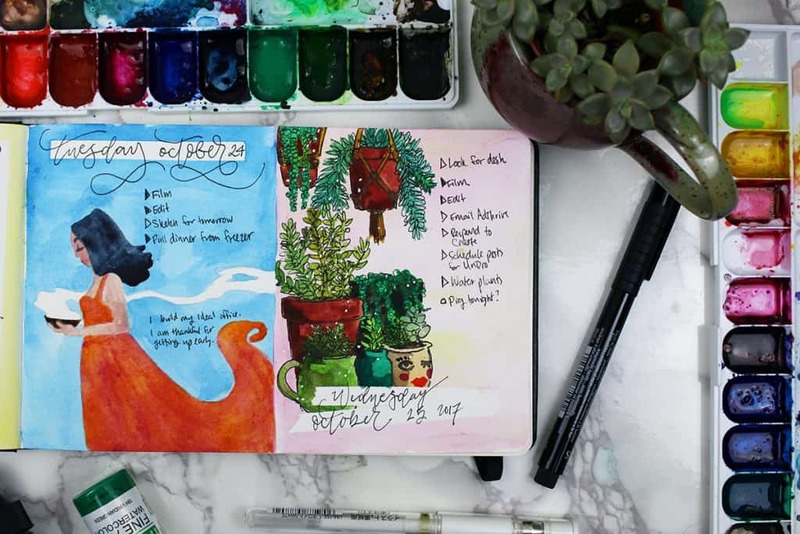 I’m so thrilled to hear you’ve started a bullet journal and you are enjoying it so much, Andrea! Thanks for being here ? oh I LOVE this watercolour month you’re doing and what has come out of it so far! LOVE LOVE LOVE big time, actually! 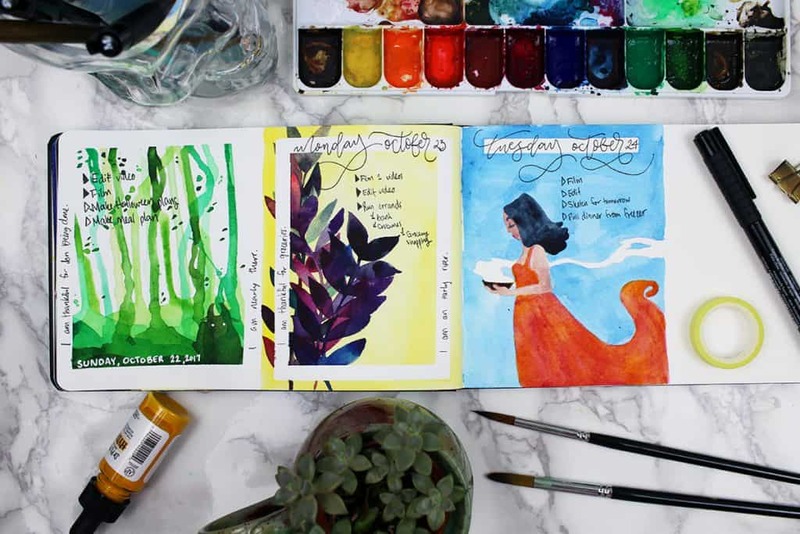 You recently came to my mind a few days ago and I wondered how it feels inside you, how you square your love for art (as shown in your art instagram) with the focus on planning and organization that this blog that pays your bills is about. I’m very happy to see you found a way to combine them here and I love looking at the pieces (and they look GREAT although I so feel your struggle!)! I know I will enjoy your videos Shelby. Thank you for inviting me. I look forward to each one. Bless you. Thanks for being here Sherry! What an amazing adventure!! 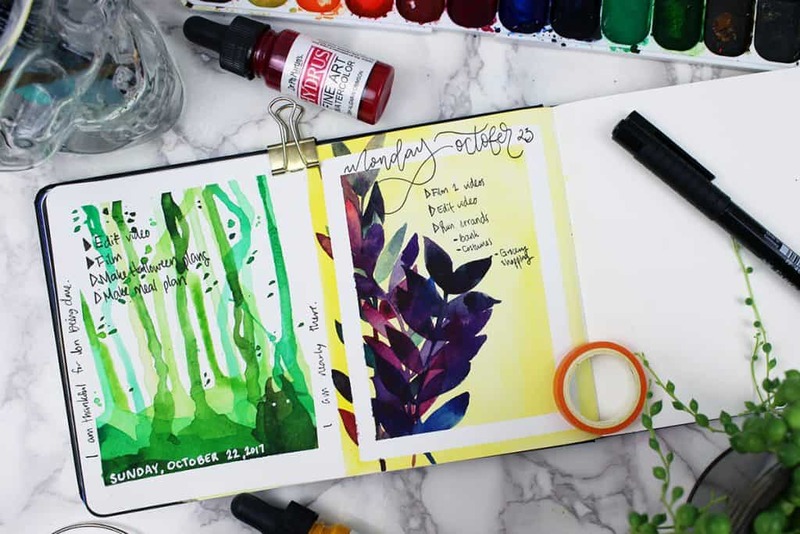 I had no idea that a watercolor planner was a thing. I’m enthralled. I’m so happy to hear that you’re excited for this!! 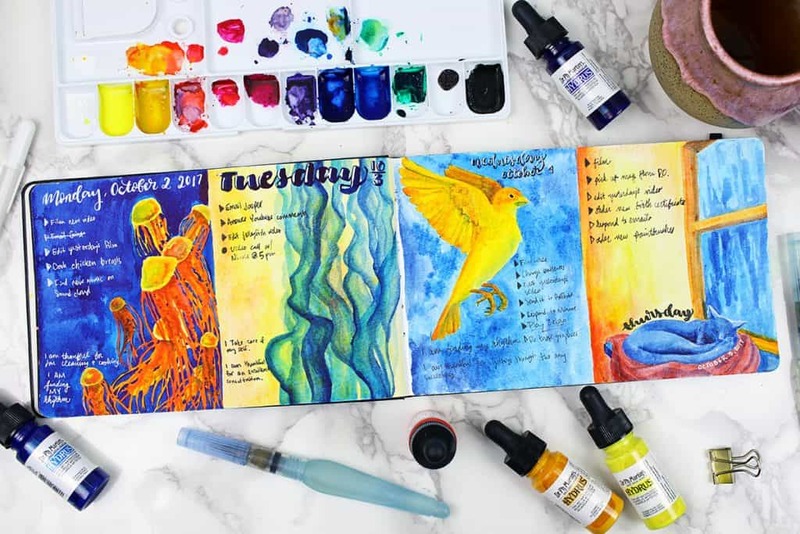 I have no idea if a watercolor planner is already a thing, but if it isn’t, why don’t we make it a thing? 😉 I can’t wait to start sharing the videos!